I’m looking for suggestions for a cake to submit in the ‘annual show’ for the village in which I live – Menston – in Wharfedale, Yorkshire. The class is ‘My favourite cake’ and, very quaint, there is one class for women and one class for men! My favourite cake is in fact ‘Reine de Saba’, as I mentioned some time ago on this blog (it’s under ‘Food’ on the top menu) but it doesn’t look very prepossessing, especially as the centre is deliberately left un- or under-cooked, which might be seen as a ‘mistake’ if you don’t know the cake. The original recipe actually calls for it to be covered in butter icing, but in the first place I don’t like butter icing and the second I think it would completely overpower the cake. I enjoy decorating cakes when I have the time but for this purpose I don’t think it should rely on decoration; it should just be an extraordinarily good cake! So, if you’ve blogged about a cake you think would make a good submission to the show please leave a comment with a link to your post about it (or a suggestion even if you haven’t blogged about it). Thanks Georgina. WordPress won’t let me post a reply to your comment so I’m putting it as an edit on the post: – I’ve had a meander through your archives and I’ve put ‘Beetroot cake with mascarpone and raspberries’ on my ‘possibles’ list because: I love raspberries, you say it’s not too sweet, we eat cornmeal mush (‘polenta’ – mamaliga in Romanian) quite a lot, it’s got ginger in it, and it’s a crazy idea! 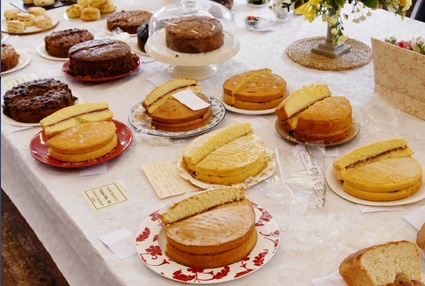 Lemon drizzle, which I make quite a lot, and Victoria sponge, are likely to have a lot of competition (and I don’t consider ‘baking’ to be top of my cooking skills) as staple village show cakes, so something ‘completely different’ seems like a good idea. it is delicious, fresh and unique. Good luck! I’m sorry that you’ve not been able to reply to my comment, and appreciate the edit to your post. I’d definitely recommend the beetroot cake that you’ve seen (even if you decide not to make it for the show). The only thing that might be worth mentioning is that is has a fairly unusual texture, so as with your Reine de Saba, if people aren’t familiar with the cake then they might think that it’s wrong somehow! And if you do make it, leave it for a day or two for the marscapone to go bright pink. But it’s definitely not too sweet. And it’s mad.